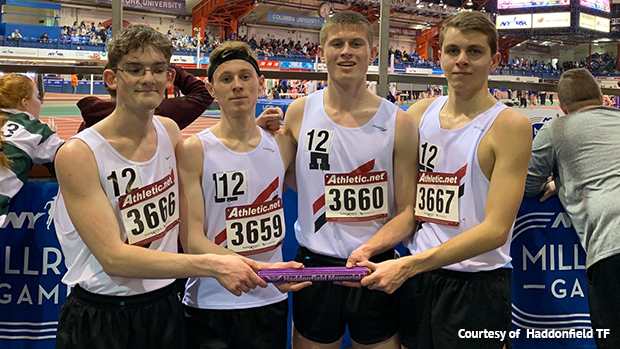 The Haddonfield 4x800-meter relay teams cranked out a pair of sizzling times, and Ola Akande and Elijah Brown scored red hot victories at the Varsity Classic on Monday at the 168th Street Armory in New York. In the boys 4x800, Haddonfield dropped a NJ#2/ US#4 7:57.56 to win the race. Meanwhile, the Haddonfield girls took over the state lead with its runner-up finish in 9:28.90, which is US#10 this season and smashed the school record of 9:31.92 set in 2017 when the Dawgs finished first at the Eastern States Championships. Haddonfield's boys splits were 2:02.7 for Greg Eisenhower, 1:59.6 for Ethan Spellmeyer, 2:004 for Martin Riddell, and a huge 1:54.8 anchor from Derek Gess.The splits for the Haddonfield girls were 2:22.4 for Sarah Naticchia 2:23.8 for Payton Weiner, 2:22.1 for Allison Colflesh , and 2:20.6 for Lindsay Colflesh. Brown, a junior at Union Catholic, dropped a huge PR when he won the 800 in an NJ#2/US#14 1:55.18. Brown blasted away from Jonah Hoey of Bishop Shanahan of Downington, Pa., who finished second in 1:57.62. Hoey has an outdoor PR of 1:52.59 from last spring and finished 14th in the 800 at the New Balance Nationals last June. In the boys 55 hurdles, Akande finished first in a NJ#2 7.40, which tied Rahway's school record set in 2009 by Pierre Darisme. Akande's victory was part of a huge day by the Rahway boys. In addition to Akande's victory, Rahway's Emari Guillette won the boys long jump (NJ#5 21-10 1/2), and Rahway's 4x800 placed second in a NJ#3 /US#7 8:01.18, which broke the school record of 8:04.02 that Rahway ran last year. Rahway's Chris Dias anchored in 1:58.6. The girls distance medley relay featured several fast times! North Rockland, with Katelyn Tuohy blasting a 4:45.5 anchor, won the race in a US#1 12:00.05. Ridgewood, with freshman Camryn Wennersten anchoring in 4:58.9 placed second in a NJ#2/US#8 12:11.27, North Hunterdon was third in a NJ#3/US#10 12:14.92, Colts Neck fifth in a NJ#4/US#14 12:17.69., and South Brunswick sixth in a NJ#5/US#15 12:19.41. Junior Nicole Vanasse of Pingry, the Meet of Champions winner in the 3,200 last winter, won the 1600m by running 5:02.95, which ranks NJ#6. In other N.J. highlights, Sydney Woods of Demarest, the state leader in the pole valt at 13-0 3/4, placed second on misses at 13-0. Liam Murphy of Allentown won the boys 3,200 in a NJ#3 9:27.03. Kaira Brown of Kent Place placed second in the girls 400 in a NJ#3/US#20 55.79, which is an indoor PR. Brown finished behind Talitha Diggs of Saucon Valley Pa. (US#8 55.10). Diggs is the daughter of NJ legend Joetta Clark-Diggs. Ivan Daniels of Ferris won the boys 200 in a NJ#3 22.10. Selena Munroe of Benedictine was first in the girls hurdles in a NJ#7 8.30. Mark Anselmi of Middletown South cleared 6-6 to win the boys high jump. Izabel Fronc of Freehold Township cleared an indoor school record 5-5 to win the girls high jump. State leader Orion Joyner of Kingsway won the boys triple jump at 45-4 1/2. Tyler Konopka of Toms River South won the boys shot put (NJ#11 52-11 1/2), and Denae Hill of West Orange captured the girls shot put (39-1). Sayreville's Mona Yuan won the girls 800 with a PR of 2:20.03. Nakaja Weaver of North Brunswick won the girls long jump with a 17-3.